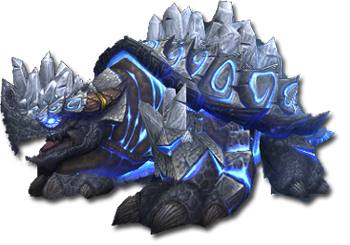 World of Warcraft Patch 5.2 brings with it the release of the Throne of Thunder raid which is the third tier of raiding in Mists of Pandaria. While it is considered one raid for normal and heroic mode, for LFR players it will be broken up into four sections. Each of these sections will be available to queue for separately and will each be covered by a separate guide on this side. This guide covers the second section of the Throne of Thunder LFR and the three bosses you will encounter in it. The bosses found here are Tortos, Megaera, and Ji-Kun. This guide is meant for LFR players only, as it covers to most critical elements of the LFR version of each encounter. The full versions of these fights are more complicated and demanding and require more in depth knowledge than provided here. Similarly, tanks are covered here briefly and it is possible to get through the LFR version with what is listed, but really if you are a tank you should do some more research and know the fights in more depth. If you haven't checked out Part 1 of this guide you can find it here: Throne of Thunder LFR Guide - Part 1. This is great fight to because it has a lot fewer mechanics than some of the previous fights from the first Throne of Thunder LFR section. Tortos himself will not move during this fight and is tanked in place. There are two different kinds of adds and a specialized interrupt mechanic in this fight that make it fun and interesting. Throughout the fight there will be falling rocks that come from the ceiling. Players need to get out of the area where they are falling. which is marked by a blue circle. Get out of the circle to avoid most of the damage. You still take some damage if you are within 20 yards of the rockfall, but it is not significant. Quake Stomp is another AOE damage ability that Tortos has, but one that you can not avoid. He will stun everyone and deal about 30% damage to everyone. Furious Stone Breath is a key mechanic that needs to be watched for and interrupted. He casts this when he reaches 100 fury. This will deal substantial damage to the entire raid and if allowed to happen will quickly wipe the group. This can only be interrupted by a special mechanic that ties in with the next item in this list. Summoned Whirl Turtles will come out from under Tortos on a set timer. DPS the turtles down until they retreat into their shells and start spinning around the room. At this point you will gain an extra ability button that allows you to kick a turtle directly away from you. The key is to kick a turtle at Tortos every time he is going to cast furious stone breath. It works best if 1 player is assigned to kick the turtles to interrupt the stone breath otherwise several players may use a turtle and you will not have one left for the next breath. A group of three turtles will spawn after every second breath, so you only have 1 spare. Summoned Cave Bats will also come into the fight and drain health from players. This drain also heals the bat, so they need to be focused down as quickly as possible. Someone should mark targets when these appear so that everyone deals with them in a set order. /raid Avoid falling rocks, DPS priority is Bats, Turtles, Tortos. Player <insert name> is assigned to kick turtles and interrupt Stone Breath. This is a really cool fight that gets harder as you go along. 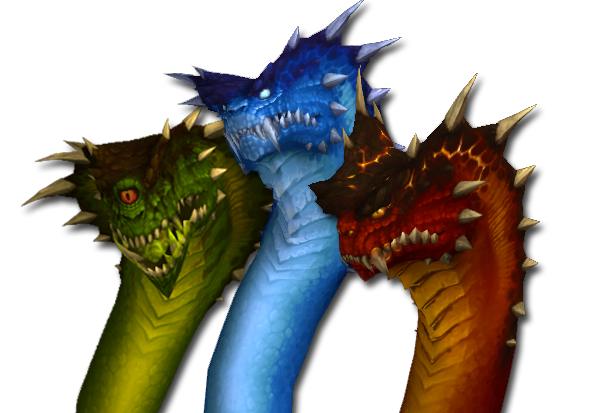 Megaera is a hydra that follows normal hydra lore, meaning that every time you kill one head, another will grow to replace it. Megaera has several heads already which are in the back ground , the three different heads that you will need to deal with: Venom, Frost, and Fire. While fighting heads in the foreground, the other heads in the concealing fog and will still attack with different abilities. When in the background this head will spit Acid Rain at random players. The area is marked on the ground so you have a little bit of warning. It will deal significant damage if you are in the area when it lands, and does less damage the further you are away from it. When in the foreground this head deals poison damage to everyone in front of it, and applies a stacking debuff that makes you take 6% additional damage from all sources for 45 seconds. This means that tanks will need to manage this stack by trading aggro. When in the background this head will hit a random player with a Torrent of Ice that deals damage to that player for 8 seconds if they are not able to move away fast enough. In addition in creates icy ground in its wake that deals damage to anyone standing in it every second and applies a 5% stacking slow effect. Tracking a torrent of ice through a flaming pool will put them out. A frost head in the foreground will deal frost damage to everything in front of it. In addition it will apply a stacking debuff that freezes you in place if it reaches too many stacks. This requires tanks to trade aggro before that happens. When in the background flame heads ignite a random player with Cinders. This deals damage over time and will melt any icy ground that the affected player runs over. When removed a 5 yard flame pool spawns at the players feet that stays there for 1 minute dealing damage to anyone in it during that time. A flame head in combat uses Ignite Flesh which deals fire damage to everyone in front of it and places a stacking DOT that lasts 45 seconds. Tanks will need to trade aggro to avoid getting the DOT stacked too high. Megaera will rampage for 20 seconds every time a head is cut off, this deals damage to all players during this time. Hydra Frenzy also occurs when a head is killed, it heals all other heads that happen to be outside of the concealing fog and causes them to attack 20% faster. Every time a head is killed all future heads of that type deal 20% additional damage, and this stacks per time the head is killed. You will need to deal with two heads at a time, and all of the heads require tanks to trade aggro and to keep them faces away from the raid. You also need to make sure that due to the stacking increase in damage that you kill heads in a specific order, meaning you should stick with a set sequence such as Venom, Frost, Fire. In this way you will keep all of the heads dealing the same damage. This fight gets significantly harder as it progresses and is really a healing check fight, as the healing requirement here is significant. /raid Kill order is Venom, Frost, Fire. Use fire to put out frost, and frost to put out fire. Stay away from all AOE as much as possible. This is a rather repetitive single phase fight against a rather nasty bird that has grown to enormous size and her young. The fight takes place on Ji-kun's roost and several nest platforms around it. There are 5 nests around and below Ji-Kun's roost. Throughout the fight 3 of the 5 nests will activate in sequence. When this happens a group of 3 DPS and a Healer will need to jump down to one and deal with the eggs before they hatch. You have 10 seconds to do so. If not killed in 10 seconds they will become hatchlings and able to attack back. If hatchlings are not killed before fed by Ji-Kun they will become fledglings and deal significantly more damage. Once dead a feather will spawn from each egg, fledgling, or hatchling, allowing you to fly to the next platform. Some nests will have mature eggs which take longer to hatch, but once they do they become juveniles, which fly around dealing damage to random players. Theses need to be killed quickly by ranged DPS if they hatch. Talon Rake hits everything in front for damage and applies a stacking debuff that increase future damage from this ability. This requires a tank swap so that you do not take too much damage. Infected Talons is another ability that makes tanks swap since it applies a stacking dot to those that are hit. Ji-Kun can deal damage to everyone in the raid with her Quills, and does so fairly regularly. AOE damage is dealt around a random player when Ji-Kun Caws violently at them. This is done to several players all at once and requires players to stay spread out. An ability that has several different effects is Ki-Kun's Feed Young, which is performed throughout the fight. If there are hatchlings up then it targets and feeds them, making them grow. If there are no hatchlings active then it is spewed in various areas around her roost. Once on the ground it deals damage to anyone in it. If a player stands in it for 3 seconds they will absorb it and then suffer damage over time for 15 seconds but remove the pool. You can also catch the food as it is thrown out, if you do you gain 30% additional damage and healing for 30 seconds but also gain the DOT that you would from standing in a pool. Lastly there is Down Draft, which pushes players away from Ji-Kun towards the outside of the platform. If you reach the edge you will be tossed off to your death. Make sure you save movement increase abilities for this as it is more powerful than Le Shi's ability from Terrace of Endless Spring. /raid Nest team is <4 player names>, kill eggs FAST. Intercept food as possible, clear slime as possible. Stay spread for Caw, move to the middle for Down Draft.